Because nothing screams party animal like carrying your own LED-lit beverage coaster around. New Potato Technologies, the creators of the Brio, call it a “smart coaster.” That’s a bit of a nebulous term, although there have been a few attempts at hacking beverage coasters using Arduino boards and such. Their interpretation seems to be an IoT smart coaster that offers a whole smorgasbord of dissonant features which they hope have the combined effect of convincing you to go to a bar or party carrying your coaster in your pocket. It has never been easier to be one of the cool kids. 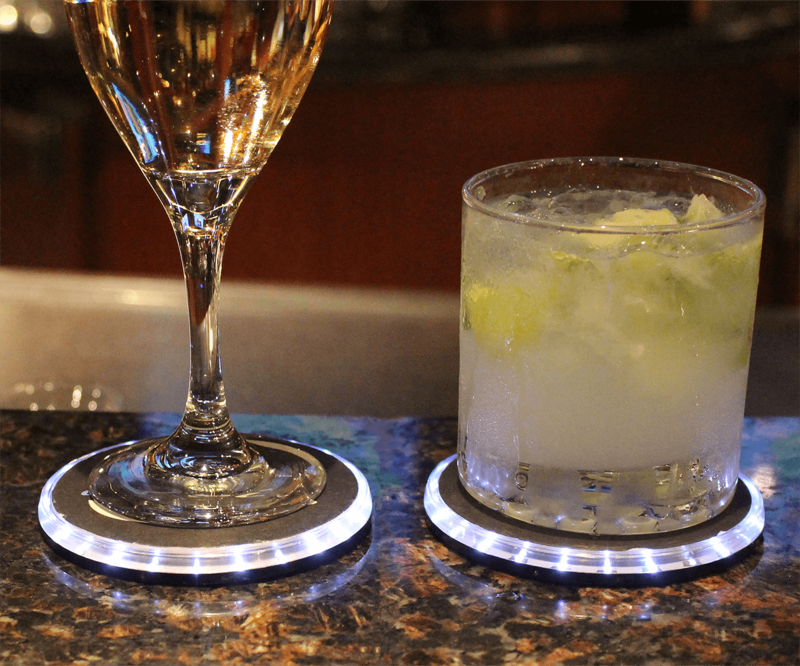 At its most basic, Brio is a smart coaster with a unique design embellished by 24 built-in LEDs. Their function isn’t purely cosmetic. You can use the accompanying Brio app (currently on iOS; coming soon to Android) to control the lighting patterns produced by the LED lights. This is supposed to help with identifying your drink if ever you find yourself in a situation where you leave it unsupervised and need help telling which ones is yours. Pulsating LED lights are cool and all, but that’s only the start. There’s a lot more Brio does to try to earn the “smart coaster” tag. Not least among those is the whole social network built around the device. That’s right–you don’t just buy a Brio, you buy into a whole community of coaster-loving partygoers with whom you can exchange information on the local nightlife scene. The social network is sort of a private FourSquare for Brio’s own network of users. You can mark and rate your favorite spots in town using ‘pins.’ Those ratings and locations are visible to other users via the app. The social network could also be used to help make plans for the evening, either by connecting with other users with a ‘Group Hoot’ or looking up featured events and attractions happening locally. The most important of Brio’s features seems to be what is called Guard Mode, which comes into play when you have to leave your drink unsupervised. Once activated, Guard Mode watches your drink to see if any motion is detected. A phone notification is fired off immediately if the glass or mug is disturbed in any way. You can see how that’s a useful feature to have handy if you’re in a shady club or with shady company. The implementation is a bit weird, though, since Guard Mode requires you to place the Brio smart coaster on top of the glass in which your drink is. Bucking prevalent trends, Brio hasn’t turned to Kickstarter to raise funds. Instead, you can just buy one right now off the website for $40, and get your hands on the absolute cutting edge of coaster technology. In big cities where there are a lot of places, I can see this being a new social network device. However, that is the only way I can see it being successful. There is no doubt that “Guard Mode” is the best thing the coaster has to offer! So you are saying that you have to bring this coaster with you everywhere you go? That is sort of a turn off for me. I thought anything similar to FourSquare was dead. It appears this company is looking to bring that social network back from the dead. LOL. Oh boy. Now we are just looking for things to “connect”. Out of hand! Yeah, no kidding. How many devices can be connected at one time? I wonder if there is a YouTube video review of this thing?